Our pick as the best available junior Bible. 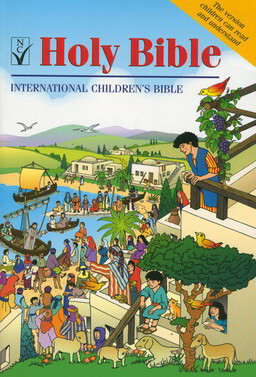 The International Children’s Bible is not an adult Bible especially packaged for children. It has been translated directly from the original texts into English that can be read and understood by children aged between 6 and 12. It has large easy-to-read type in two columns; short sentences and simple, modern vocabulary; over 40 pages of maps and illustrations and a dictionary. I have been using this bible since I got my first copy as a seven-year old, in 1994. When I got saved, officially, my interest in it renewed, and I started re-studying it at 16 years of age. Now, I am 27 and I use it along with other more advanced bibles to really translate the essence of what it is the Word is saying to me as adult and to me as child. I then use it, alongside the NIV and ESV to teach my Children’s Church Monthly Memory Verse. On a more personal level, it helps me to relax from the intellectual rigours of trying to understand the complicated language of some translations, by it’s simplicity. In my bookcase – definitely a favourite! I recently bought this for the 10 year old daughter of a friend of mine, and was pleased to see when visiting today that she is still reading it! It is good to have a full translation of the Bible which appeals to children. The illustrations are very good. I have also used it as a teacher – again it is good for children to get some sense of the whole book, rather than just having Bible Stories – however well re-told.